Starting a DIY project for your children can be a daunting task. This could be a swing set, climbing frame or tree house – all of these things require a little forward thinking and good planning so here are some tips to make sure you create something your children will play on for years to come. Decide how much space in your garden the play equipment will take up. There is no good in planning a monster climbing frame if you will have no garden left at the end of it. Remember your whole family uses the garden, so don’t give the entire thing over to the children. Also bear in mind that if you are building something that is tall, it may over shadow your garden so you may want to consider how tall you can make it. 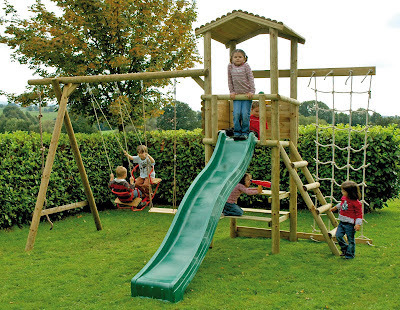 In most countries, you will not need planning permission for building children’s play apparatus in your garden. In England, there are things to consider for climbing frame planning permission which can be read via the link. Usually, you will be fine but it is worth checking Also, if you are making a tree house or climbing frame which is tall, it may over look your neighbours gardens. Have a chat with them – try to come to an amicable agreement about your project before you go ahead – they will respect you for approaching them first and hopefully will be fine with it. When planning the project, the whole point is for your children to play and have fun with it. Ask your children what they enjoy doing most – think about their age and ability too. There is no point in building something so hard to climb up that your children won’t be able to use it for a few years! Equally, there is no point in planning something that your children will out-grow quickly. Making sure your children get the most out of all your hard efforts is important. There are lots of accessories and accessory packs that you can get for fairly reasonable prices, which can improve the function and fun factor of any project. These could be rock climbing stones, slides, swings, and imagination accessories such as telescopes or steering wheels. All these things will make your frame/tree house or den look like one of the really expensive ones bought ready-made! So aside from impressing everyone, you will give your children that extra enjoyment from the play equipment. Finally – Plan, plan and plan again! Just like any DIY project planning is key. You have decided what area in your garden the project will take up, you have cleared it with the neighbours and hopefully the family(! ), and you know what you want to include. You then need to make detailed plans, including timescales. There is nothing worse than a project dragging on, not only will it deflate you but your children will be disappointed to have their dreams shattered when it grinds to a halt. Make sure you know what materials and tools you need, enlist help if need be for difficult bits and speak to people such as builders merchants or friends to get advice on your project. You may be able to save time by getting all the materials cut to size for you, and this can sometimes be more efficient as you won’t end up wasting ay wood. Written by Abbi Stewart, creator and designerof bespoke climbing frames at the Big Game Hunters Climbing Frame Shop.